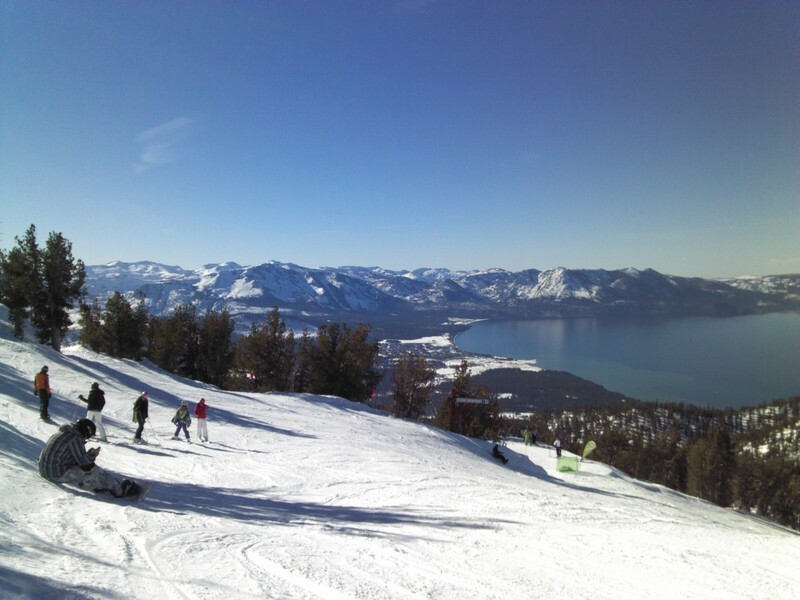 In a strange coincidence J. and I decided to go up to Tahoe and ski away on Saturday. We had initially planned for Sunday by decided then we wanted to go Saturday. The trip up was great – we made it in no time, thanks to careful planning – and then we proceeded to going up and down as many times as we could. On the way up from the gondola for lunch, we chatted with a couple that was going up for the first time boarding. They had rental equipment (wise) and no experience at all. We tried giving them a few tips and hints, but I was shaking my head inside. As we got up, it started snowing a little. Not a big deal, really, and we continued. It was really cold (mind you, I am used to cold), and the snow was already compacted into a thick ice sheet; not the best snow conditions. J. and I did a lot of boarding together, including a miserable "two-fer" (where I try to do two runs for one of his). As we decided to go down, we lost sight of each other (I had to restrap my Flows) and I ended up going down the slope on my own. A half hour later (and several phone calls) J. arrives, tired after doing the roundabout, scared to heck by the narrowness and the incredible rudeness of skiers. While I was waiting in the car, I noticed how the snow was starting to fall, and the sky darken. Instead of getting my usual fix of *Bux, I decided it was warrented to run away as fast as possible to avoid an impending storm. To no avail: as we got to the Highway (US 50), a stream of car was forming and we were blocked. We turned around to buy gas and realized it was probably an accident that had blocked the road entirely. We waited for two hours, the only forward motion due to cars ahead of us turning around, and then started calling friends to see if anyone could give us more information (no, the CHP does not update the snow conditions report if there is an accident). Then we turned around and decided we would try the North Lake route. Down Pioneer Trail, up on US 50, making it barely over the turnoff to the left (Incline Village). We made it across Northstar (no snow yet) and got onto I 80 just to find out there was a snow advisory in effect. The truck (a Land Rover) made it up just fine, and we passed the inspection unasked. Farther up, though, things started turning crazy. A bunch of Bay Area drivers started losing control of their vehicles, and we saw one swiping wildly left and right, then finally catching itself after a passing spree of reckless proportions. A Lancer that was driving very aggressively ended up in a ditch on the side of the freeway. Further up, the snow was covering the freeway and more vehicles were on the side of the road. We made it back around midnight. Leaving at 4:30 to get in at midnight – 7.5 hours sitting in the car! And yet, it was worth it. Now, of course, those that try to go up won’t have much fun, but there are going to be 14" of fresh powder. And maybe some more will fall until I get to the mountain on Friday!